Making a Folder in "My documents"
know where My documents are, skip the first 3 steps!!! 1. Double Click on My Computer on the desktop. 3. Double Click on(Open) "My Documents"
If above is not clear, put cursor in open spot and do a "Right Click"
And name it "Home PC" And then hit enter. When you hit enter it becomes a Folder. 1. Right click the folder you just made "Home PC "
2. 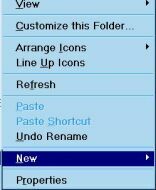 Move down the menu to make a left click on"Rename"
3. Type in "Home PC2" and hit enter. It now has a new name. 1.Right click on "Home PC2"
2.Select "delete" and make a left click, the folder is deleted. change the name of a Folder.Now to practice what we have learned.